CNBC's Jim Cramer says many Americans support President Trump’s trade war with China, but contends that their voices are being drowned out. "If you're going to take on the Chinese, you do it from strength," Cramer contends. "We have much more strength than they do." Just after midnight on Friday, the United States and China exchanged $34 billion worth of tariffs. CNBC’s Jim Cramer said Friday that many Americans support President Donald Trump’s trade war with China, but contended that their voices are being drowned out. “We simply, as a people, seem to be united that the president's position is wrong. I hear more of that on TV than I hear reality. I think that there are a lot of people [who say], ‘Thank you for standing up for us,’” Cramer said on CNBC. Just after midnight on Friday, the United States and China exchanged $34 billion worth of tariffs. The American duties affect products such as water boilers, X-ray machine components, airplane tires and various other industrial parts. The Chinese targets include soybeans, pork and electric vehicles. Cramer, the host of “Mad Money,” contended the time is right for the president to engage China on trade because the U.S. economy is so strong. The three-month job growth average of about 211,000 nonfarm positions, which Cramer cited, reflects the data released by the government in the June employment report on Friday morning. The Labor Department said the U.S. economy generated a better-than-expected 213,000 jobs last month. The April and May numbers were both revised higher to 175,000 and 244,000, respectively. Ahead of the jobs report, economists were already pointing to an economy gaining steam. CNBC’s Rapid Update tracker put the expected advance in gross domestic product at 3.8 percent for the second quarter. 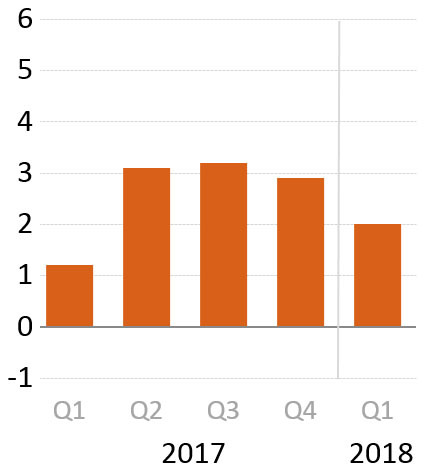 GDP only rose 2 percent in the first quarter, but the January-March period is notorious for underwhelming. Growth was 2.9 percent in the fourth quarter 2017, and above 3 percent in Q3 and Q2 last year. Trump has made economic growth of more than 3 percent a goal of his administration.